What are your summer plans? For many people, this is the season of schedules jam-packed with fun outings and excitement. 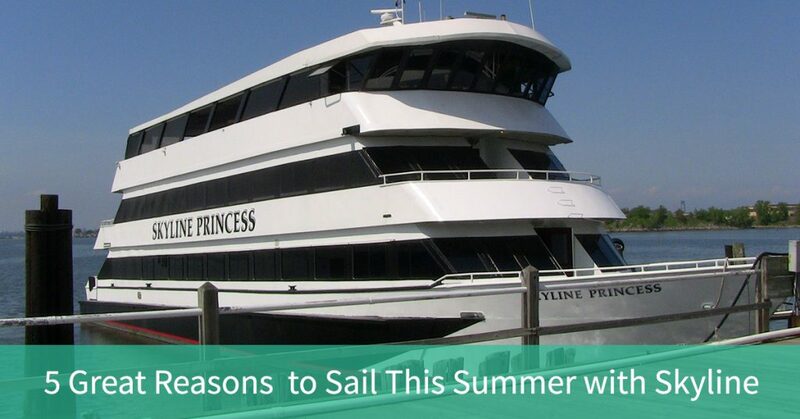 If you’re looking to make your summer memorable, you should “Sail This Summer with Skyline.” We’ve hosted all types of events, or maybe you just want to kick back on one of our public brunch or dinner cruises. It’s up you. Whether you’re planning a party, entertaining corporate clients or just want to see the sights of the greatest city in the world, you’ll find what you’re looking for on a Skyline Cruise. Let us give you 5 reasons to sail with us this summer. We’ve been in business since 1993 and we’ve hosted corporate events, meetings, fundraisers, weddings, charity auctions and every type of celebration you can think of. We have helped plan birthdays, sweet 16 parties, and anniversaries. We work with groups of all sizes and all budgets. A Skyline cruise costs less than you think. You can rent out our full luxury yacht, the Skyline Princess for your event or you can rent a private deck on one of our public dinner cruises. Some of our most popular weddings are small, casual events that only take one or a few tables. Whatever you’re looking for, reach out and we’ll try to accommodate you. The Skyline Princess has three decks with the top deck, also known as the “skylight deck,” equipped with a dance floor and a DJ space. The top deck can be enclosed as Skyline Cruises in all types of weather. You can adapt the other two decks for what you need. For example, you can make the lower deck a dining space and you can use the middle deck as a meeting area, casino, for a casino fundraiser, an auction space, or an area for more dining. Skyline leaves from our home port at the World’s Fair Marina, and we also provide full ship private charters from many ports in NY, NJ, LI, Westchester, and Connecticut. If you’re a visitor to New York City or have lived here all your life, seeing the most famous sites in the world from our many viewing decks aboard the Skyline Princess is something you’ll never forget. Whether you’re hosting a large formal wedding or a small, intimate ceremony, Skyline can help you plan the perfect wedding. Many are performed by our dear friend Captain Arnold, who has been a Coast Card licensed captain for 40 years, and the only Captain who is an ordained chaplain registered with the New York City’s Clerk’s office. We’ll help you plan the ceremony you desire from a formal sit-down yacht wedding to a modern cocktail reception. We can create an unforgettable LGBT wedding cruise as well. We can work with you to fit your needs and budget. All of our food is provided by our in-house chef and we can provide you with all sorts of options if you’re planning an event or celebration. We offer catering packages that give you choices of hors d’oeuvres, entrees, carving stations and side dishes. We also provide salad, fruits, cheeses flat bread and desserts as well as a celebration cake. 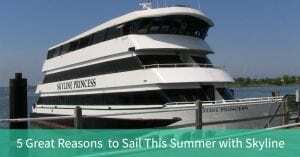 Skyline Cruises has it all and we’ll get you ready for your summer event, celebration or adventure. All you have to do is book your cruise. Contact us to get started.